Every once in awhile I make myself I nice big stack of pancakes from. So last Saturday I decided to make myself some and I accidentally discovered a recipe for crepes. How does one accidentally discover a recipe? I got the stuff together for the pancakes and noticed I was out of baking powder. I looked at the ingredients and wondered if crepes were basically just pancakes with out the baking powder. So I gave it a try. Mix in a bowl 1 1/2 cups of all-purpose flower, 1 teaspoon salt and 1 tablespoon white sugar. Melt 3 tablespoons of butter. I put it in the microwave for about 40 seconds then let it cool for a bit. To the dry mixture at 1 1/4 cups of milk and 1 egg. Start mixing. After a few seconds start slowly adding the butter while continuing to stir. I finally stir in a teaspoon of vanilla extract. At this point I thought the consistency wasn’t quite liquid enough so I stirred in a 1/4 cup of water. I heated up a cast iron skillet and added a small amount of butter to melt. I didn’t measure out the amount of batter I poured into the skillet. I just guessed a good amount and used the back of a spoon to spread it out a little bit. I cooked them 1 minute on the first side and then 30 seconds on the other. 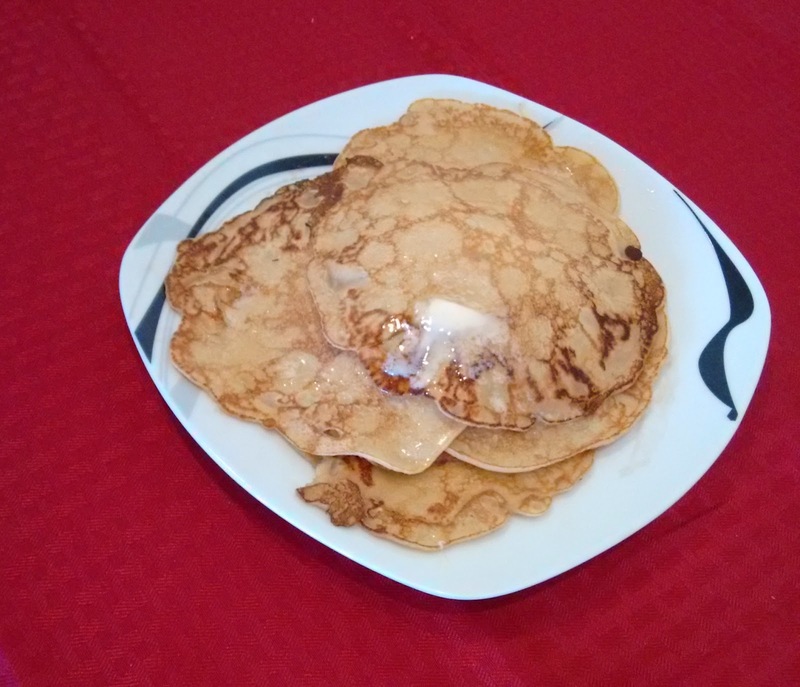 Viola crepes. They came out very tasty. This makes enough for two people so I took about half and put them in a ziplock bag and tossed them in the fridge. Next morning I just popped them in the microwave for 60 seconds and they were good to eat.